The research activities of the Laboratory of Enzyme & Synthetic Biotechnology (ESB) lie at the interface of biology, chemistry and engineering. It is a multi-disciplinary lab employing researchers with different types of expertise, such as molecular biology, engineering, chemistry and agricultural sciences. 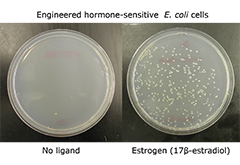 The main goal of ESB is the development of engineered microbial cells with the ability to perform novel and complex functions by employing principles of Synthetic Biology. The lab utilizes simple organisms, such as the bacterium Escherichia coli, the yeasts Saccharomyces cerevisiae and Pichia pastoris, and the microalgae Spirulina platensis and nannochloropsis as “biological chassis” and seeks to evolve them into efficient “cell factories” for the production of valuable chemical and biological products, and for the performance of industrially important processes, such as drug sensing and discovery, biotransformations etc. Genetic engineering techniques are applied in order to redesign and rearrange the genome of the organism of interest, while protein engineering (directed protein evolution) and synthetic biology approaches are utilized so as to introduce novel functions in the cell. A key aspect of the work that is carried out is the design and development of high-throughput screening systems, which are used to isolate the rare biomolecules and microbial strains that execute the desired function among large combinatorial libraries comprising hundreds of millions of variants. It has been widely recognized that many incurable diseases with an enormous socioeconomic impact, such as Alzheimer’s disease, Parkinson’s disease, amyotrophic lateral sclerosis type 2 diabetes etc., are initiated by a common molecular mechanism: the misfolding of specific proteins. With the ultimate goal of identifying compounds with potentially therapeutic effects against these disorders, we have developed a highly versatile synthetic biology platform for the discovery of macrocyclic rescuers of disease-associated protein misfolding. In this system, large combinatorial libraries of cyclic oligopeptides (>200 million members) are biosynthesized in Escherichia coli cells and simultaneously screened for their ability to rescue disease-associated protein misfolding using an ultrahigh-throughput genetic screen. Hit compounds identified by this screen, are subjected to more detailed evaluation by biochemical and biophysical methods of protein analysis, and their ability to inhibit protein misfolding-induced pathogenicity is evaluated using appropriate mammalian cell assays and in vivo models of the disease of interest. 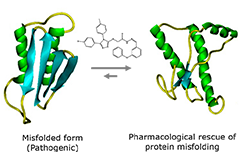 Medicinal chemistry approaches are subsequently employed to optimize the biological properties of the bioactive macrocycles in order to generate therapeutic leads against the target diseases. Schematic representation of our engineered bacterial platform for the discovery of macrocyclic rescuers of MisP misfolding and aggregation. 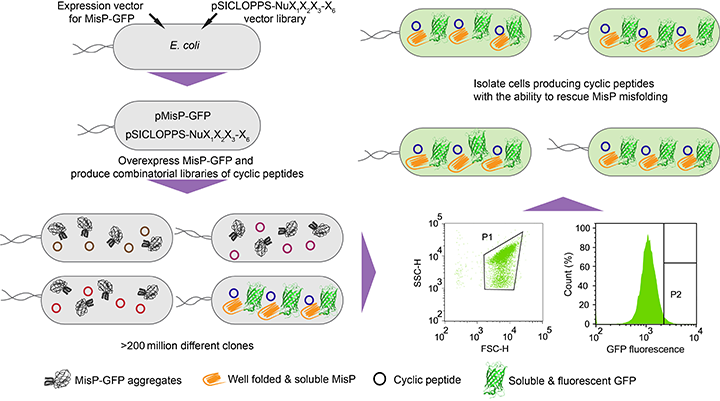 MisP: misfolding-prone protein; pMisP-GFP: plasmid encoding a MisP-GFP fusion; pSICLOPPS-NuX1X2X3-X6: vector library encoding the combinatorial library of cyclic oligopeptides P: sorting gate. (top, left) Chemical structures of the selected cyclic pentapeptides ΑβC5-34 and ΑβC5-116; (top, right) TEM images of aged Αβ42 solutions in the presence and absence of the selected cyclic pentapeptides ΑβC5-34 and ΑβC5-116; (bottom, left) Paralysis of C. elegans worms expressing human Αβ in their body wall muscles under the control of a heat-inducible promoter, in the absence and presence of the selected cyclic oligopeptides ΑβC5-34 and ΑβC5-116; (bottom, right) Fluorescence microscopy images of C. elegans nematodes showing reduced formation of Αβ aggregates when treated with two of our selected cyclic pentapeptides ΑβC5-34 and ΑβC5-116. Taken from Matis, I. et al., Nature Biomedical Engineering, 2017. (top, left) Structure of homodimeric SOD1 (taken from Banci, L. et al., Proc Natl Acad Sci USA, 2009); (bottom, left) Chemical structure of the selected cyclic pentapeptide SOD1C5-4; (top, right) Circular dichroism spectra of SOD1(A4V) incubated with/without the selected cyclic pentapeptides SOD1C5-4, ΑβC5-34 or ΑβC5-116 at room temperature for 90 d (1:1 and 5:1 indicate cyclic peptide:SOD1(A4V) molar ratios). Taken from Matis, I. et al., Nature Biomedical Engineering, 2017; (bottom, right) ΗΕΚ293 cells transiently expressing SOD1-GFP or SOD1(A4V)-GFP in the absence and presence of the selected peptide SOD1C5-4 or the Αβ-targeting cyclic pentapeptide ΑβC5-34, and visualized by confocal microscopy. We have identified hundreds of head-to-tail cyclic oligopeptide sequences that inhibit the misfolding and aggregation of Αβ. 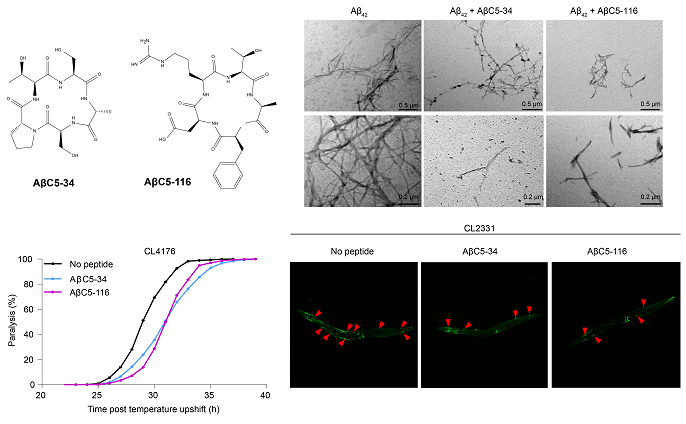 For four of them, termed ΑβC5-34, ΑβC5-116, ΑβC7-3 and ΑβC7-19 we have shown that they interfere with the normal course of Aβ aggregation and the formation of typical Aβ fibrils, generating species with reduced binding to the neuronal surface and reduced cytotoxicity in vitro and in vivo. We have identified hundreds of head-to-tail cyclic oligopeptide sequences that inhibit the misfolding and aggregation of mutant human SOD1, associated with familial forms of ALS. For one of them, termed SOD1C5-4, we have shown that it interferes with the normal course of mutant SOD1 aggregation and the formation of typical mutant SOD1 aggregates in vitro. We have found that SOD1C5-4 is cell-permeable and that it reduces the formation and cytotoxicity of mutant SOD1 aggregates in human cell line cultures. Kostelidou, K., Matis, M., and Skretas, G*. 2017. Microbial genetic screens and selections for monitoring protein misfolding: tools for the identification of disease-relevant genes and the discovery of potential therapeutic compounds against neurodegenerative diseases. Current Pharmaceutical Design. In press. Delivoria, D.C., Chia S., Habchi, J., Perni, M., Papaevgeniou, N., Matis, I., Chondrogianni, N., Dobson, C.M., Vendruscolo, M., Skretas, G.* 2018. Bacterial biosynthesis of a 200-million-member macrocyclic library and genetic screening for the identification of chemical rescuers of β-amyloid aggregation and toxicity. In preparation. 2018-2021. Hellenic Foundation for Research and Innovation. Research Projects for Postdoctoral Researchers. Project title: “Targeting secretion and misfolding of α-synuclein to reduce transmission of pathology in Parkinson’s disease: An interdisciplinary approach coupling neurobiology with biotechnology”. Coordinator - Principal Investigator: Dr. Evangelia Emmanouilidou. Total budget: 180,000 €. Lab budget: 50,000 €. Role: Partner. 2017-2019. National Strategic Reference Framework 2014-2020. General Secretariat of Research and Technology – Research program “KRIPIS”. Project title: “Targeted therapeutic approaches against degenerative conditions_B”. Coordinator - Principal Investigator: Dr. Alexandros Pintzas. Total budget: 900,000 €. Lab budget: 24,000 €. Role: Partner. 2016-2017. State Scholarships Foundation (IKY) Fellowships of Excellence in Postgraduate Studies - Siemens Program. Post-graduate research fellow: Dr. Zacharoula Linardaki. Total budget: 24,000 €. Lab budget: 24,000 €. Role: Coordinator - Principal Investigator. 2015-2017. State Scholarships Foundation (IKY) Fellowships of Excellence in Postgraduate Studies - Siemens Program. Post-graduate research fellow: Dr. Stamatia Bellou. Total budget: 37,000 €. Lab budget: 37,000 €. Role: Coordinator - Principal Investigator. 2013. John S. Latsis Public Benefit Foundation – Scientific Studies. Project title: “Using bacteria and worms for the battle against Alzheimer’s disease”. Coordinator: Dr. Niki Chondrogianni. Total budget: 12,000 €. Lab budget: 6,000 €. Role: co-Coordinator. 2013-2015. National Strategic Reference Framework 2007-2013. General Secretariat of Research and Technology – Research program “KRIPIS”. Project title: “Targeted therapeutic approaches against degenerative conditions”. Coordinator: Dr. Alexandros Pintzas. Total budget: 1,500,000 €. Lab budget: 48,000 €. Role: Partner. 2012-2015. National Strategic Reference Framework 2007-2013. General Secretariat of Research and Technology – Research program “ARISTEIA”. Project title: “Directed Evolution of Small-Molecule Therapeutics Against Neurodegenerative Diseases”. Total budget: 216,000 €. Lab budget: 190,000 €. Role: Coordinator- Principal Investigator. 2012-2015. National Strategic Reference Framework 2007-2013. Greek Ministry of Education, Research and Religious Affairs – Research program “THALIS”. Project title: “Biosynthesis and Genetic Selection of Cyclic Peptides with Potential Therapeutic Effects Against Alzheimer's Disease: Inhibitors of Aβ aggregation”. Coordinator: Dr. Stathis Gonos. Total budget: 540,000 €. Lab budget: 171,000 €. Role: Principal Investigator. 2011-2015. FP7 European Union Marie-Curie International Reintegration Grant. Project title: “Directed evolution of small-molecule cancer therapeutics”. Coordinator: Dr. Sotiris Kyrtopoulos. Total budget: € 100,000. Lab budget: € 100,000. Role: Marie Curie Fellow. 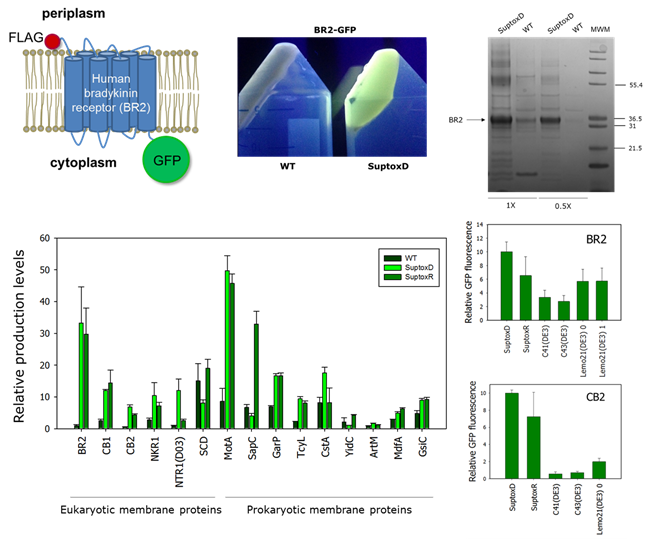 Membrane proteins (MPs) perform critical cellular functions in all living organisms and constitute major targets for drug discovery. Escherichia coli has been the most popular overexpression host for membrane protein biochemical/structural studies. Bacterial production of recombinant membrane proteins, however, is typically hampered by poor cellular accumulation and severe toxicity for the host, which leads to low final biomass and minute volumetric yields. We have recently demonstrated that it is possible to rewire the E. coli protein-producing machinery so that it can withstand the toxicity caused by membrane protein overexpression, and that engineered bacterial strains with the ability to achieve high-level MP production can be generated. To achieve this, we searched for bacterial genes whose co-expression can suppress membrane protein-induced toxicity and identified two highly potent effectors: the membrane-bound DnaK co-chaperone DjlA, and the inhibitor of the mRNA-degrading activity of the E. coli RNase E RraA. We have generated two new E. coli strains co-expressing either djlA or rraA, which we have named SuptoxD and SuptoxR, respectively, and we have shown that these new strains accumulate markedly higher levels of final biomass and produce dramatically enhanced yields for a variety of prokaryotic and eukaryotic recombinant membrane proteins. In most cases that we have tested so far, either SuptoxD, or SuptoxR, or both, outperform the capabilities of commercial strains frequently utilized for recombinant membrane protein production purposes, such as C41(DE3), C43(DE3) and Lemo21(DE3). 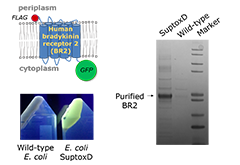 Recombinant membrane protein production in the engineered E. coli strains SuptoxD and SuptoxR. (top, left) Schematic representation of a constructed fusion of the human bradykinin receptor 2 (BR2) with GFP; (top, center) Fluorescence of E. coli MC1061 (wild-type, WT) and SuptoxD cells expressing the BR2-GFP fusion; (top, right) Purification of fusion-free and detergent-solubilized BR2 from E. coli MC1061 (WT) and SuptoxD cells; (bottom, left) Comparison of the accumulation levels of a variety of eukaryotic and prokaryotic recombinant recombinant membrane proteins in E. coli MC1061 (WT) with SuptoxD and SuptoxR cells; (bottom, right) Comparison of the fluorescence of SuptoxD and SuptoxR cells producing chimeric fusions of the human bradykinin receptor 2 (BR2) and the human central cannabinoid receptor (CB2) with GFP with the fluorescence of equal culture volumes of C41(DE3), C43(DE3), and Lemo21(DE3) cells producing the same proteins. We have developed the first set of engineered bacterial strains, termed E. coli SuptoxD and SuptoxR, with a general ability to suppress the cytotoxicity caused by the overexpression of recombinant membrane proteins. Either SuptoxD, or SuptoxR, or both, have been found to outperform the capabilities of commercial strains frequently utilized for recombinant membrane protein production purposes, such as C41(DE3), C43(DE3) and Lemo21(DE3) in all cases that we have tested so far. 2016-2019. National Strategic Reference Framework 2014-2020. Fellowships for Doctoral Research. Doctoral research fellow: Myrsini Michou. Total budget: 29,400 €. Lab budget: 29,400 €. Role: Coordinator- Principal Investigator. 2013-2015. State Scholarships Foundation (IKY) Fellowships of Excellence in Postgraduate Studies - Siemens Program. Post-graduate research fellow: Dr. Kalliopi Kostelidou. Total budget: 40,000 €. Lab budget: 40,000 €. Role: Coordinator- Principal Investigator. 2011-2015. National Strategic Reference Framework 2007-2013. General Secretariat of Research and Technology – Research program “SYNERGASIA”. Project title: “Development of novel Angiogenesis-Modulating Pharmaceuticals by screening of natural compounds and synthetic analogues”. Coordinator: Prof. Nektarios Aligiannis Total budget: 1,412,000 €. Lab budget: € 150,000. Role: Partner. Enzymes are biocatalysts used in a wide range of “white biotechnology” applications. Hydrolases, a specific class of enzymes, have received great attention due to their high selectivity, potential synthetic ability and broad range of applicability, especially in the production of fine chemicals and pharmaceuticals. Despite their advantages, a very limited number of hydrolases are currently being used in the industry. This is due to the fact that many industrially relevant processes require high temperatures where conventional biocatalysts perform poorly. For such processes, thermo- or hyperthermostable enzymes are required. Thermophilic organisms are a potential rich source of such enzymes, which, however, remains largely unexplored. To address this, we apply systematic genomic and metagenomic screening approaches to identify novel hydrolases from microorganisms residing in extreme environments around the globe. Wohlgemuth, R., Littlechild, J., Monti, D., Schnorr, K., Siebers, B., Menzel, P., van Rossum, T., Kublanov, I., Rike, A.G., Skretas, G., Szabo, Z., Peng, X., Young, M. 2018. 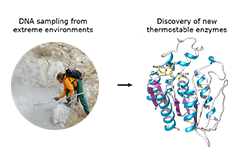 Discovery of Novel Hydrolases from Hot Environments. Biotechnology Advances. Submitted for publication. Ladoukakis, Ε., Koutsandreas, Τ., Pilalis, Ε., Zarafeta, D., Menzel, P., Krogh, A., Skretas, G., Kolisis, F.N., Chatziioannou, A. 2018. ANASTASIA: a distributed pipeline for automated integration, analysis and functional characterization of next-generation sequencing metagenomic datasets. In preparation. 2017-2018. National Strategic Reference Framework 2014-2020. General Secretariat of Research and Technology – Research program “Research support with an emphasis on young researchers”. Project title: “Novel biocatalytic devices for effective exploitation of plant biomass”. Coordinator: Prof. Ηaralambos Stamatis. Total budget: 56,350 €. Lab budget: 15,000 €. Role: Partner. 2015-2017. Research Program “Excellence” State Scholarships Foundation (IKY) - Siemens. Project title: “Thermostable enzymic nanodevices as catalysts for the production of biofuels from renewable carbon sources”. Coordinator: Prof. Dimitris Hatzinikolaou. Total budget: 50,000 €. Lab budget: 24,800 €. Role: Partner. 2011-2015. FP7 European Union Cooperation Program KBBE-2010.3.5-04 - Microbial diversity and metagenomic mining for biotechnological innovation. Project title: “Systematic screening for novel hydrolases from hot environments”. Coordinator: Prof. Xu Peng. Total budget: 5,500,000 €. Lab budget: 150,000 €. Role: Partner. 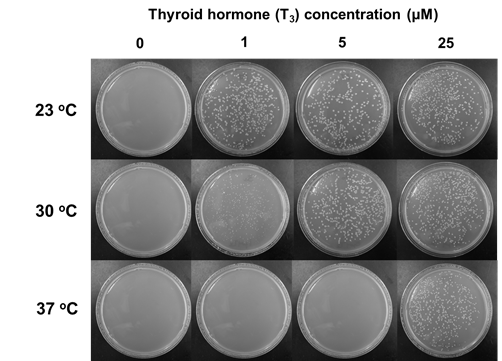 E. coli cells producing one of our engineered protein-based thyroid hormone sensors and grown in the absence or presence of triiodothyronine (T3) at different incubation temperatures. Taken from Skretas and Wood, Protein Science, 2005. 2015. John S. Latsis Public Benefit Foundation – Scientific Studies. Project title: “Protein tools for programming cell behavior in synthetic biology”. Total budget: 12,000 €. Lab budget: 12,000 €. Role: Coordinator- Principal Investigator. We have shown that virgin olive oil endogenous amphiphiles (including proteins) stabilize olive oil-in water emulsions. We have shown that phycocyanobilin, a bioactive tetrapyrrolic compound of blue-green alga Spirulina, binds with high affinity and competes with bilirubin for binding on human serum albumin. We have discovered and characterized biochemically a melanin and humic acid-like polymer complex from olive mill waste waters. We have discovered and characterized biochemically heat-stable lipolytic enzyme activities of the marine alga Nannochloropsis oceanica. Sotiroudis, T.G., Sotiroudis, G.T., Varkas, N., Xenakis, A. 2005. The role of endogenous amphiphiles on the stability of virgin olive oil-in-water emulsions. J. Amer. Oil Chem. Soc. 82, 415-420 (2006 Archer Daniels Midland /Protein and Co-Products Division Best Paper award in the Chemistry and Nutrition category of the American Oil Chemists’ Society). Tzika, E.D., Sotiroudis, T.G., Papadimitriou, V., Xenakis, A. 2009. Partial purification and characterization of peroxidase from olives (Olea europaea cv.Koroneiki). Eur. Food Res. Technol. 228, 487-495. Xenakis, A., Papadimitriou, V., Sotiroudis, T.G. 2010. Colloidal structures in natural oils. Curr. Opin. Colloid Interface Sci. 15, 55-60. Tzika, E., Christoforou, M., Pispas, S., Zervou,M., Papadimitriou, V., Sotiroudis, T.G., Leontidis, E. Xenakis, A. 2011. Influence of nanoreactor environment and substrate location on the activity of horseradish peroxidase in olive oil-based w/o microemulsions. Langmuir, 27, 2692-2700. Papadimitriou, V., Tzika, E. D., Pispas, S., Sotiroudis, T. G. Xenakis, A. 2011. Microemulsions based on virgin olive oil: a model biomimetic system for studying native oxidative enzymatic activities. Colloids and Surfaces A: Physicochemical and Engineering Aspects, 382, 232-237. Parages, M.L., Rico, R.M., Abdala-Díaz, R.T., Chabrillón, M., Sotiroudis, T.G., Jiménez, C. 2012. Acidic polysaccharides of Arthrospira (Spirulina) platensis induce the synthesis of TNF-α in RAW macrophages, J. Appl. Phycol. 24, 1537-1546. Sotiroudis, T.G., Sotiroudis G.T. 2013. 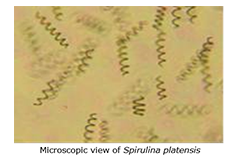 Health aspects of Spirulina (Arthrospira) microalga food supplement. J. Serb. Chem. Soc. 78, 395-405. Kyriazi, A., Papadimitriou, V., Sotiroudis, T.G., Xenakis, A. 2013. Development and characterization of a digestion model based on olive oil microemulsions. Eur. J. Lip. Sci. Technol. 115, 601-611. Papadimitriou, V., Dulle, M., Wachter, W., Sotiroudis, T.G., Glatter, A., Xenakis, A. 2013. Structure and Dynamics of Veiled Virgin Olive Oil: Influence of Production Conditions and Relation to its Antioxidant Capacity. Food Biophysics, 8, 112-121. Markou, G., Iconomou, D., Sotiroudis T., Israilides, C., Muylaert, K. 2015. Exploration of using stripped ammonia and ash from poultry litter for the cultivation of the cyanobacterium Arthrospira platensis and the green microalga Chlorella vulgaris. Bioresour. Technol. 196, 459-468. Savvidou, M.G., Sotiroudis, T.G., Kolisis, F.N. 2016. Cell surface and cellular debris-associated heat-stable lipolytic enzyme activities of the marine alga Nannochloropsis oceanica. Biocatal. Biotrans. 34, 24-32. Khemakhem, M., Papadimitriou, V., Sotiroudis, G., Zoumpoulakis, P., Arbez- Gindre, C., Bouzouita, N., Sotiroudis, T.G. 2016. Melanin and humic acid-like polymer complex from olive mill waste waters. Part I. Isolation and characterization. Food Chem. 203, 540-547. Khemakhem, M., Sotiroudis, G., Mitsou, E., Avramiotis, S., Sotiroudis, T.G., Bouzouita, N., Papadimitriou, V. 2016, Melanin and humic acid-like polymer complex from olive mill waste waters. Part II. Surfactant properties and encapsulation in W/O microemulsions. J. Mol. Liq. 222, 480-486. COST Action BM1405 | Non-globular proteins - from sequence to structure, function and application in molecular physiopathology (NGP-NET) | 26 March 2015 - 25 March 2019. Dr. Georgios Skretas is serving as a Management Committee member for Greece. COST Action BM1307 | European network to integrate research on intracellular proteolysis pathways in health and disease (PROTEOSTASIS) | 25 April 2014 - 24 April 2018. Dr. Georgios Skretas is serving as the 1st substitute Management Committee member for Greece. COST Action CM1303 | Systems Biocatalysis (SysBioCat) | 20 November 2013 - 19 November 2017. Dr. Georgios Skretas served as the 1st substitute Management Committee member for Greece. European research network ERA-Net “Synthetic Biology” (ERA-Synbio). Dr. Georgios Skretas has served as a Representative of the General Secretariat of Research and Technology of Greece to meetings and workshops.